This scarf is knit with a right twist stitch to create interest, texture, and thickness. And it creates a simple ribbed pattern on the other side, making the scarf reversible. Knit in a silk and merino blend, Just A Little Twist is a luxuriously soft scarf to wrap around your neck this winter. Two skeins of Malabrigo Silky Merino make the perfect little scarf, or try it with any other DK weight yarn. Stitches used: k, p, sl1, RT. 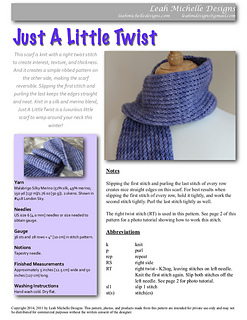 This easy pattern contains a photo tutorial for working the right twist stitch. The photo tutorial can also be found online at leahmichelledesigns.com. Finished measurements: Approximately 5 inches (12.5 cm) wide and 50 inches (127 cm) long. For the worsted weight version of this pattern, see A Bigger Twist.